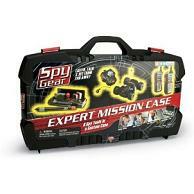 Toy sale going on with the Wild Planet Spy Gear Expert Mission Case. List price of 59$, previous discount of 39$ and the current sale price after check-out is just 19$! Eight spy tools that come in this custom case. The audio car has tremendous sound quality but is just a wind-up car. It’s also worth noting that other reviewers have noticed static with the walkie talkie part of the spy case. My son loves this too, little espionage guy.